The second century of the American experiment was just coming to a close and the First Amendment was 185 years old when the U.S. Supreme Court radically reinterpreted the meaning of free speech. In 1976 the court ruled that money is speech. Having legislated from the bench that money talks, the nation's highest and most activist court dictated early last year that money can talk as much as it wants. No limit can be placed on election spending by corporations and other interest groups. Now the Supremes have an Arizona public financing law in their sights. Judging from this week's oral arguments, it's certainly possible if not likely that the court will strike down a key component of the law as an unconstitutional infringement on free speech. It's a foregone conclusion that Justices Roberts, Scalia, Alito and Thomas will vote to invalidate the law approved by Arizona voters back in 1998. Justices Breyer, Ginsburg, Sotomayor and Kagan seem likely to uphold it. The law's fate rests with Justice Anthony Kennedy, who said he is "tempted" to strike it down. If the court does indeed do that, it will be effectively ruling that not only does money talk and not only can it talk as much as it wants, but any effort by the public to enable those who are not well-endowed financially to get a word in edgewise violates the First Amendment right of free speech. As Jerry Seinfeld would say, we are entering Bizarro World. When it comes to free speech, the United States Supreme Court seems poised to take us to a place where up is down and everything is opposite of what common sense tells you. Arizona's law bans no speech. It places no restriction of any kind on any sort of speech. If candidates or interest groups are speaking, the law enables others to speak too. It creates more speech. But by the Bizarro logic that five of the nine Supreme Court justices seem to be applying to the situation, creating more speech infringes free speech. The First Amendment is 45 words long. It does not say money is speech. Nowhere does the word money appear. Nowhere does it say a state cannot take steps to prevent politicians from being bought and our government from being owned. The money-is-speech doctrine does not come from an act of Congress or any state law. It is a judicial invention. Nowhere in those 45 words does it say that corporations are people. In fact, the word corporation does not appear a single time in the entire U.S. Constitution or any of its amendments. The money-can-talk-all-it-wants doctrine granting corporations free speech rights and allowing unlimited corporate spending on elections cannot be found in the text of the Constitution or the First Amendment, and it does not owe its origins to an act of Congress or any state law. It is another judicial invention. These unelected judges-for-life are now working on the completion of an unholy trinity in campaign finance jurisprudence. Money talks. Money can talk as much as it wants. Money should do all the talking. 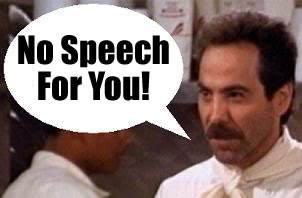 Nowhere in the First Amendment does it say that speech is a privilege that must be purchased at great expense. Nowhere in our founding documents or in the law does it say it is impermissible to try to establish a more level playing field in elections by enabling those who are not outlandishly wealthy to be heard. For the court's current five-member to say so would be the latest judicial invention. Mike, aren't they violating equal protection rights of the people that do not give money? That's a simple, succinct, and excellent article, Mike. Fantastic Mike. We need clarion calls now more than ever, and the phrase "The money-is-speech doctrine does not come from an act of Congress or any state law. It is a judicial invention." may just qualify. I'll be adding that a signature line, and attributing you.